We offer full service landscaping services, and with over 30 years of experience no job is too big for us. Backyards Plus installs retaining walls, pavers, boulders, rocks, stone stairways, flagstone walkways, sprinklers, fences, trees, shrubs, plants, flowers, and more. 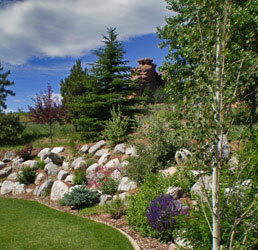 We install both traditional and xeriscape landscaping materials that are friendly to our high plains environment. We also offer landscape design services that will make your dream yard a reality. Having your dream yard designed by a professional landscape designer is the best way to ensure that your outdoor living project is done right the first time. A landscape design pays for itself by having a well-thought plan from the start and not having to redo multiple sections of your yard. Our designers specialize in water-friendly xeriscape designs as well as traditional landscaping. We will bring your vision to life. We offer a number of different design packages such as black & white designs, color designs, renderings in black & white or color, and digital imaging.